As an avid gamer, you’ll want the best gaming headset in order to get the best out of each gaming experience. This goes for everything, especially the headset that you choose to use. This can really have a huge impact on sound quality and completely change the way you experience and perceive a game. Have a good headset can even make you a better gamer because you’ll be able to hear whisper-silent warnings in the background! With so many companies and manufacturers who produce and sell gaming headphones, it can be difficult to choose one that will best suit your needs and provide excellent quality, comfort, and durability. That’s why we’ve pulled together this comprehensive guide to help you out! Conclusion: What is the best gaming headset? PCs, Xbox One, PS4, and mobile devices. What Type Of Sound: Stereo Or Surround? This might be the first dilemma you stumble upon when researching the best headset to buy. The main difference is this: stereo sound implements two channels for audio, one of the left ear and one for the right ear, while surround sound utilizes up to eight of them to provide an all-around audio. Although the option of surround sound seems cool, in reality, a set of headphones can only capture so much of that effect. Most surround sound systems only become really obvious in rooms with speakers at every corner. However, most configurations of surround sound systems in headphones allow you to hear things sneaking up on you during gameplay and essentially hear everything you can’t see. This, of course, is a great feature for serious gamers. On the other hand, stereo sound is an oldie but a goodie. It’s been around for ages due to its reliability, and due to the fact that it doesn’t have to help you visualize the world around you, there will be no comprising in the sound quality. In addition, excellent quality stereo systems will even help with positional audio. Most headsets will come with a form of boom microphone attached. But mic quality is very important to ensure that your teammates and friends can hear you during gameplay, as many manufacturers may compromise in the mic department in order to make a headphone affordable. A good microphone will not cut in and out while you’re speaking into them, and it should be able to pick up even your quieter voice to avoid this. Some microphones may attempt to cancel out any background noises from your environment so that your teammates don’t hear them. Although you should be aware that this usually means that sounds under a certain volume will automatically be excluded. This means you will need to constantly speak at a specific volume to be heard. In addition, a microphone should be easily adjustable so that it doesn’t get in the way when you’re gaming. Some headsets may even have the mic built into the set so that it isn’t protruding or sticking out, in which case you have to make sure that it will pick up your voice regardless. Also, you should be able to easily mute or control the volume of your microphone – and the headset itself – via in-line controls or at least dials that are easy to access. If you don’t like the sound of microphones on the headphones, then you can always opt to purchase a mic separately. You can then choose a set of headphones without a mic, or if you must purchase one with it, opt for one that is adjustable and can be muted and put out of the way so you can comfortably ignore it. 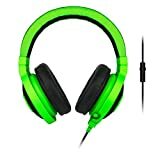 If you tend to game for hours on end, then you’ll need a headset that is comfortable and that won’t give you too much grief. 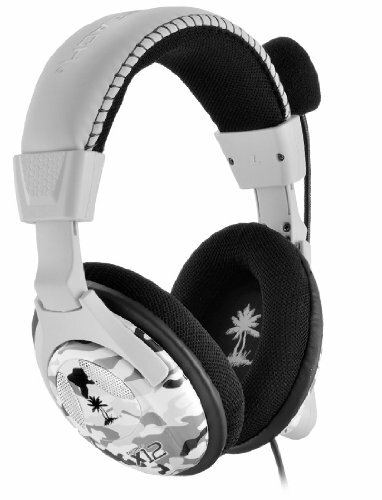 As such, a headset that is lightweight, well-cushioned, and breathable is very important. Ear cups are an important feature of a set of headphones. They should be well-cushioned but not collect moisture or become too hot after a certain period of time. It would also be helpful if they incorporated some form of swivel so that you can move them around if they do start gathering heat. A set of headphones should not put too much pressure on your head or feel heavy. It would be best if they’re lightweight enough that you forget you’re wearing them! They should also be adjustable so that you can use them however you want, and so that it can accommodate your specific head shape and size. The HyperX Cloud Headset is our best choice for several reasons. First, basically it’s a 7.1 surround system you wear on your head; each set of headphones is designed to immerse players in their gaming experiences fully. Second, it’s able to meet everyone’s gaming expectations and needs. It’s simple; the HyperX is compatible with PC, Mac, Xbox One, and Xbox One S, PS4 and PS4 Pro, mobile gaming systems like phones and tablets, and VR headsets. The CloudX model has been tested and licensed by Microsoft for our Xbox readers. If you have any experiences with gaming headphones, you’ll know that some can quite uncomfortable to the point where you stop using it. This set of headphones is designed to withstand even the most severe damage, built with a lightweight yet extremely durable aluminum frame without sacrificing comfort. Audio quality is an essential feature for gaming headsets. The audio on subpar gaming headsets can be bad, from constant feedback, echoing, electrostatic interference, etc. A set of headphones with a high virtual audio output can be a wise investment for dedicated gamers; the HyperX Cloud has a virtual audio output of 7.1 with Hi-Fi capability. The back-electret condenser-type microphone itself has noise canceling technology, much like the technology built into shooting headphones, so the players on the other end won’t have to listen to annoying background noise while you game. The mic is activated when the player speaks directly into the microphone. You can remove the microphone if you want to use the headset strictly as headphones too. The set of headphones has a headphone driver unit of 53mm and a frequency response of 15Hz-25kHz. Given the size of the driver, the maximum volume output is much higher than you’d find in a set of earbuds, combined with its 15Hz frequency responses. The headset comes in just five Hz below the human limit, it has some of the better acoustics in both higher and lower tones. You don’t have to pause your games to go into the menu or mess with the volume of the TV to adjust the volume of the HyperX. It has both in-line audio controls where you can mute and adjust the audio and an advanced USD audio control panel with a built-in digital signal processing sound card that significantly amplifies the audio and your voice. The Cloud comes with a two-year warranty and free technical support from HyperX, making it the preferred headset for many league gaming teams including Team Liquid and SK-Gaming. The next set of headphones in our review is a simple gaming headset without any of the extra features that some high-end gaming headsets have to offer. Some gamers prefer all the additional amenities, but many prefer to plug and play, this is a set of headphones for those who prefer simplicity. The Razer Kraken Pro is simple, comfortable and a great option to consider without having to shell out an arm and a leg as you would on other high-end headsets. It comes available in two colors, black, and a vibrant lime green color and according to Razer, the Kraken Pro is their most comfortable headset ever. The memory foam earcups are very large and fit over your ears very well, and the memory foam padding on the underside of the headband makes sure the set won’t squeeze your head or earlobes during extended gaming sessions. It’s light enough to stay comfortable and balanced on the head without being too over encumbering. This is an entirely analog direct headset; it doesn’t offer any wireless capability. The setup is straightforward, you don’t need a USB port for initial setup, just plug the 3.5 mm audio jack into an audio port and you’ll be chatting with other gamers and getting into the game without any complicated setup procedures. The 4’ 3” cord is long enough to connect to a computer underneath a desk and stretch from a console to a chair depending on your set up. If you need a more extended connection, you can use a PC adapter cable to add a few extra feet of reach. 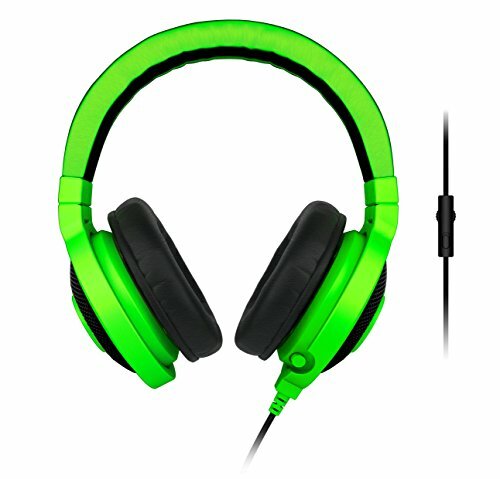 There are some slight inconveniences to this headset though, there are no external volume controls, so all volume adjustments must be made manually, nor can it support surround sound, all the volume adjustments must be made on the in-game menu or a connected device. Overall, the audio and dialogue quality is pretty decent, but the lack of sound card and volume controls tend to make the tones and bass a little more muted and choppy, but it works exceptionally well for voice chatting and gaming. You can remedy this by turning the bass and treble down. It’s compatible with PC, Xbox One, PS4, tablets and mobile devices. It comes in five different price points, each offering different accessory options as well as several sizes of drivers, the most popular being 40mm and 50mm. The cable, despite being braided, twists and tangles very easily. 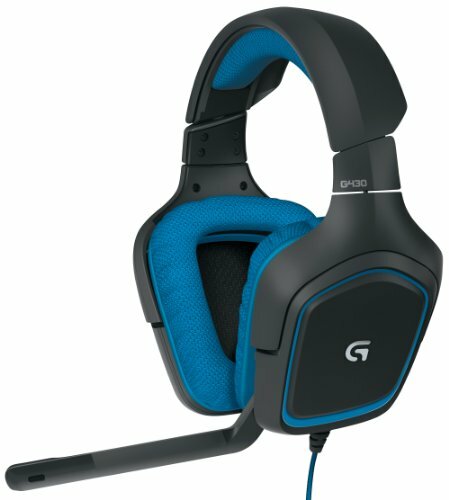 I took one look at the Logitech G430 headset and immediately noticed how comfortable this set of headphones looks. The design is simple with a solid black frame and blue cloth embroidered memory foam padding around the ear cups. The G430 aesthetics are very similar to the Logitech G230 black framing and red cloth embroidery. Comfort is essential for long-term gaming, so attributes like padding, ease of use, and functionality are important. The ear cups are ergonomically designed to fully encapsulate the ear while the under of the headset is also padded in the same fashion. One unique feature is the porous padding to aid in absorbing sweat; you can disassemble the set of headphones and ear cups for cleaning and maintenance. Design aside, the G430s virtual audio output of 7.1 surround with a frequency response of 20Hz, which can be extremely loud if left unchecked, but the headphone driver unit is only 40mm, so the maximum volume of the headphones is below damaging levels. To achieve 7.1 surrounds, you must install Logitech’s Gaming Software from their website. The Gaming Software program is very user-friendly, you can customize the volume, adjust the bass and treble settings and the option to adjust seven different speakers in the headphones. Despite all these audio settings, you still have to rely on your master volume, and there’s no internal sound card. The microphone has a pressure gradient electret condenser with integrated noise-canceling software. You can’t remove the mic from the headset and lift it from your mouth won’t mute it, but there is a mute switch on the in-line control built into the headsets audio cord. The headphones itself has a 3.5 audio jack to connect to devices microphone jacks, but it does come with a USB adapter for connecting to devices that accept them, such as the PS4. The set of headphones is compatible with Windows Vista, 7,8,10 and can be used on PS4 while the stereo mode is enabled. You can also use the USB adapter to connect the G430 to a variety of devices. This model is of the best gaming headset we have on this review. The USB soundcards feel fragile and need to be handled very carefully to avoid breaking. Sony. First and foremost, the headphones itself comes in a sleek and minimalistic design that stays in line with the black and blue PlayStation aesthetic. Sony has also released the Gold headset in a white glacier model as well. 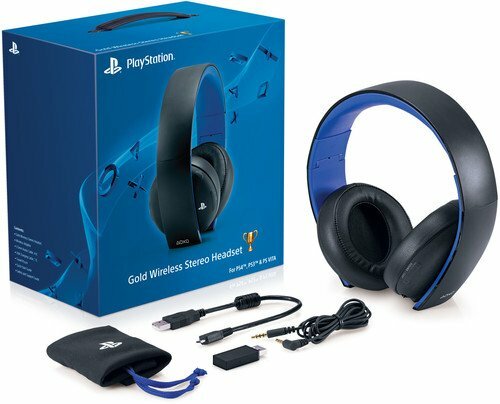 The design is in line with the PlayStations previous wireless stereo headset, but the Gold model offers more features and better overall design. The headband itself is a single padded arch that fits comfortably over the players head with minimal discomfort and little pressure on your head. The padded earpads are embroidered leather that fit comfortably over your ears and fabric mesh for added moisture wicking. The Gold is very convenient for traveling gaming, the ear cans fold up and snap into place, you can stow them away in the headphones carrying case for added protection. Since there are no hardwired cords to the headset, you don’t have to spool the cables up; the entire unit is wireless. If added customization is a crucial feature to you, the Gold Wireless Headset’s side panels can be removed and swapped out with plates of your choosing. The controls are in touch with the minimalist design, the power button, which doubles for switching between preset audio profiles. There are also buttons for adjusting the volume of the headphones and a button for toggling the mute chat settings. You can individually adjust both the in-game audio and the chat volume. Since the device is wireless, it relies on a wireless USB dongle, not Bluetooth, to tether to the PS4 but it does have an audio jack for connecting the headset to PC, PS Vita, tablets, and smartphones. The only issue I have with the audio jack option is the headsets audio and mute buttons aren’t compatible with any devices besides the PS3 and PS4. Its power source is internal and is charged by plugging a micro USB cord into the micro USB port on the side of the headphones. Its driver is only a 40mm driver, so the maximum volume output isn’t ear shattering but it does have 7.1 surround quality when gaming on the PS3 and PS4, but stereo quality audio while using other devices. Some gamers have said the headset lacks a little in the bass department but makes up for it with its virtual audio quality. Since we covered a headset that specifically for Sony’s PlayStation. We felt it was good-natured to review a set of headphones that work in tandem with Microsoft’s Xbox and PCs, and that headset is the legendary Turtle Beach X12. If you’ve never used a gaming headphones before, Turtle Beach is very well known for their fantastic gaming headsets with virtual audio quality that enhances even the softest in-game sounds. From my own experience,, I’ve used this headset a lot in my personal life before I switched to Xbox One and I have nothing but great things to say about it. We’ll start with the external design of the Ear Force X12. The ear cups connected to the headband by solid plastic brackets, making it a very sturdy headset that’s meant to withstand the most severe punishments in the heat of an intense gaming session. The earcups are large but not overbearing to the point of discomfort and are padded with semi-ridged foam and breathable cloth mesh. The headband is also padded but fully adjustable, so they comfortably stay on heads of all shapes and sizes. The microphone is a little bit different than other gaming headsets; instead of a rigid microphone peripheral, the X12s mic is connected with a flexible cord that can be adjusted in relation to the speaker’s mouth. You can customize the audio settings of the headphones while it’s connected to an external device, but it comes with an in-line audio adjustment switch that has dials for in-game volume, chat volume, a mute button and bass and treble adjustment dial. This is where it gets a little confusing. Most headsets only require a single connection, wireless dongle, or audio jack but the X12 uses a 3.5 audio jack to plug into audio and microphone jacks while you also must connect the headsets separate USB cable to the device itself. I’ll give you an example of what I mean; you plug in the headsets 3.5 audio jack into the Xbox controller and the USB cord into the Xbox. The X12 features 50mm speakers which deliver stereo-quality in-game sound, the dialogue is clear, and video game audio is thunderous. Titian Fall combined with X12s is intense, the explosions are ear-shattering, and the sound of the mechs stomping is bone chilling. The headpshones mic has a mic monitoring feature where the player can hear their own voice as well as the games audio, so you don’t have to shout over the volume. As it is a stereo headset, the product comes with a large amount of wires that can be inconvenient to get around. All of these gaming headsets promise great features and usability, but we simply must point out that the HyperX Cloud Gaming Headset beats out the rest by a hair. Its award-winning status and the fact that it is used and endorsed in professional gaming circles is a good sign in itself, but add on the durability, ease of use, and absolutely excellent sound quality and it easily takes the cake. With any luck, we’ve helped narrow down your choices to these five gaming headsets! It’s important to choose one that suits your gaming habits and will work well for the type of gamer that you are.